1, 2 & 3 night packages available! Package includes bed & breakfast, dinner each night plus tea & scone on arrival! 1 night bed & breakfast plus 1 hour thermal suite, hydrating back treatment and more! Our fabulous wedding packages offer style, individuality and excellent value. Clayton Whites Hotel in Wexford is one of the leading conference hotels in Ireland, with top class conference and meeting facilities, suitable for any group size. Get away from the hustle and bustle of everyday life in the Tranquillity Spa at Clayton Whites Hotel. Indulge and be pampered to bring out your inner glow. Wonderful gifts for all occasions. Vouchers can be used for overnight stays, treatments at the Tranquillity Spa, dinner at the Terrace Restaurant or membership at Club Vitae Clayton Whites Hotel. Huge thanks to all the staff in the hotel for helping my sister have an amazing hen. You all went above and beyond and everyone loved the hotel and the food. 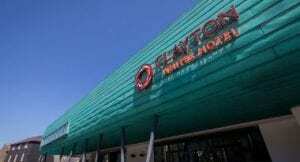 I will definitely be recommending Clayton Whites Hotel to family and friends. The support provided by the hotel to the conference organisers in advance was top class as was the assistance and attention to detail from staff throughout the conference. Feedback from delegates in relation to catering, hotel facilities and accommodation was extremely positive. The staff are so lovely, we fell in love with the place and staff so much that we have now booked our wedding with them! Excellent hotel, staff were very friendly and helpful, food was lovely. Will be back again. Great holiday all you could ask for friendly staff nice food. The place was so child friendly. The leisure centre was fantastic. The spa is beautiful, it is absolute tranquillity. All the staff that I have ever dealt with are lovely. The treatments are fantastic, the relaxation area is lovely.